Winner of the Philippine National Book Award, this pioneering volume reveals how the power of Filipino family-based oligarchies both derives from and contributes to a weak, corrupt state. From provincial warlords to modern managers, prominent Philippine leaders have fused family, politics, and business to subvert public institutions and amass private wealth—an historic pattern that continues to the present day. 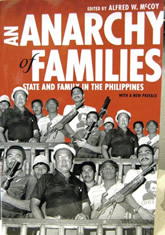 Edited by Alfred W. McCoy, An Anarchy of Families explores the pervasive influence of the modern dynasties that have led the Philippines during the past century. From the Osmeñas to the Lopezes and Pardo de Taveras, elite Filipino families have acted as formidable coalitions —controlling capital, dominating national politics, and deploying paramilitary force. Beyond Manila, strong men such as Ramon Durano, Ali Dimaporo, and Justiniano Montano have used “guns, goons, and gold” to accumulate wealth and power in far-flung islands and provinces.